Just want to share some old memories and history about the Skyline Drive-in movie theater that was in Moses Lake, Washington. The drive-in opened in 1952 as the first area outdoor theater but it closed around the early 1980s. It had 300 spaces when it opened and later apparently expanded to 450 spaces for cars. Located on 8 acres, the drive-in was just off what used to be the old Larson Highway just north of the Grant County Fairgrounds. 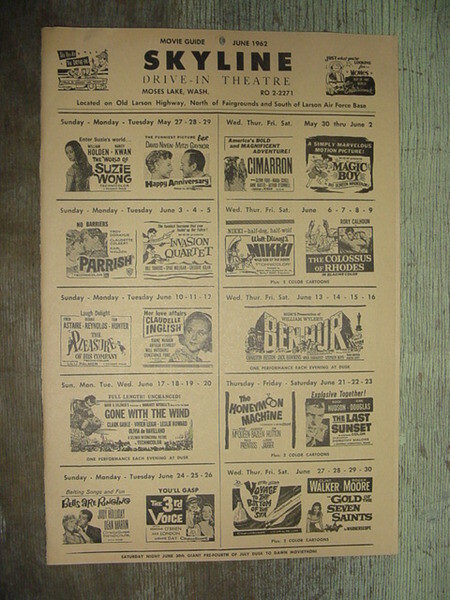 According to the Columbia Basin Herald archives the drive-in opened in July 1952 featuring Bud Abbott and Lou Costello in “The Invisible Man” and a Roy Rogers western. Here is an original photo of the marquee sign taken around mid 1970 when the drive-in was still open. I have many fond memories of going to the movies at this outdoor drive-in as a kid and later in high school on dates in the 1970s. It was always fun to see friends and have a little pizza along with an ice-cold pop from the snack bar during intermission. Below is an old vintage movie poster from 1962. The theater featured that June, several classic movies including Cimarron, Ben-Hur, Gone with the Wind, and Voyage to the Bottom of the Sea. Here is another later photo of the Skyline Drive-in sign taken around 1999. The drive-in closed around 1984 and was torn down possibly in early 1990. There is now a mini storage business located on the property. 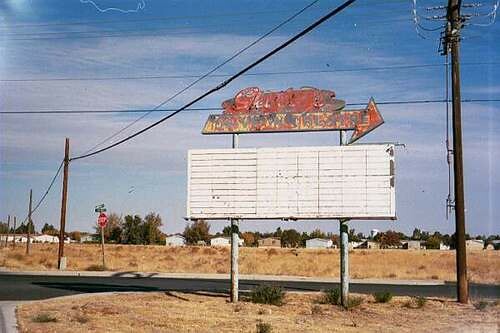 The old Skyline Drive-in in Moses Lake may be gone but it is not forgotten in memories of many of us who had the pleasure of catching a movie or just hanging out in a car full of friends on a summer evening. If you have a memory or comment about the old Skyline Drive-in, I’d love to hear from you. Please comment or send a photo if you have one to share.